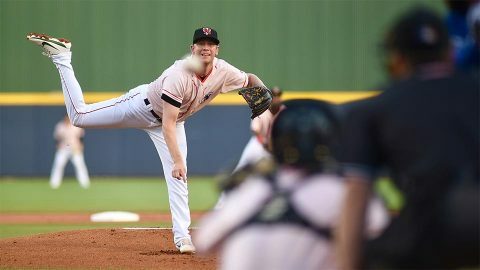 Nashville, TN – Matt Milburn hurled six shutout innings to lead the Nashville Sounds to a 1-0 win over the Oklahoma City Dodgers in front of 9,782 fans at First Tennessee Park Saturday night. Milburn got the best of a prime pitchers’ duel between a pair of youngsters. His six scoreless frames came in just his second career Triple-A start. Oklahoma City starter Caleb Ferguson was equally tough as he blanked the Sounds for five innings. The 21-year-old lefty walked three and struck out 10 in his Triple-A debut. Nashville’s Jake Smolinski broke the stalemate when he launched a solo homer off Adam Liberatore into the Hyundai Deck in left field to give the Sounds a 1-0 lead in the bottom of the sixth inning. From there, the Sounds’ bullpen did the rest. Southpaw Jeremy Bleich relieved Milburn and put up a pair of zeroes in the seventh and eighth. Bobby Wahl took over in the ninth and worked a perfect frame to record his fifth save of the season. Milburn’s gem was his first win at the Triple-A level. The shutout was Nashville’s fifth of the season, and their third 1-0 win in 2018. Game three of the five-game series is scheduled for Sunday night at First Tennessee Park. Right-hander Kyle Friedrichs (0-0, 0.00) starts for the Sounds against left-hander Manny Banuelos (4-3, 3.40) for the Dodgers. First pitch is scheduled for 6:35pm. With tonight’s 1-0 win, the Sounds improved to 25-23 on the season. Nick Martini extended his consecutive on-base streak to 36 games when he singled in the seventh inning. It’s the longest active streak in the Pacific Coast League. Since April 14th, Martini has reached safely in every game he has played in. Nashville starter Matt Milburn became the third Sounds pitcher in 2018 to record a start of 6+ IP and 0 R, joining James Naile (April 15th vs. Omaha, 7 IP) and Daniel Gossett (May 1th5 at Memphis, 6 IP).